Wild Birds Unlimited: Does Wild Birds Unlimited Sell Mealworms? Does Wild Birds Unlimited Sell Mealworms? Mealworms-Another treat to attract wild birds. Wild Birds Unlimited in East Lansing, MI do sell live and dried mealworms. Feeding live mealworms (Tenebrio monitor) as a special treat has become a very popular way to attract a different variety of wild birds. If you haven't used mealworms before, they are the larvae of a beetle with a high protein level. 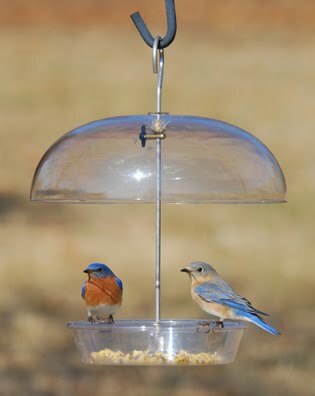 Many birders believe the mealworms are used solely for attracting Bluebirds. This is definitely not the case as many other species enjoy these little treats. Some birds attracted to mealworms include: wrens, robins, bluebirds, jays, sparrows, cardinals, woodpeckers, nuthatches, titmice, chickadees, and even Purple Martins. Mealworms can be offered from just about any bowl, and there are some feeders at Wild Birds Unlimited specifically for feeding mealworms. The WBU Dinner Bell feeder (in side picture) is one of our most popular feeders. Most people “train” the birds to come at the same time, same place every day. Some people whistle or wear a bright hat to signal the birds you are about to feed. Our experience has shown that the early birds like to get the worms. Birds are hungry in the morning and it’s always nice to start the day with a good breakfast. You can also feed them in the evening before they roost. Start out by placing a teaspoon of worms in a feeder near where you see the bird perching. Sometimes I like to put them out with an apple slice. The worms can have a yummy last meal and the birds enjoy the juicy worms and may even enjoy the apple as dessert. As you get more birds trained to come you can increase the amount of worms to about a teaspoon of worms per bird per day. Once the birds have figured out where you are feeding, you can move the feeder short distances every day or so until it's located where you can view them comfortably. Our Wild Birds Unlimited 500 count medium mealworms come in a mixture of bran and can be stored for several weeks in the refrigerator if they are fed. To feed your mealworms remove them from the refrigerator once every 2 weeks and feed them an apple for 24 hours at room temperature. This is how they get their drink of water and will stay fresh and plump. Then remove any uneaten apple, add about one inch of bran, or crushed Wheaties to the container and place back in the refrigerator. REMEMBER: To maintain mealworms keep them dry and well ventilated. NOT TOO DEEP! -Maximum depth of worms and bran no more than 1 inch deep. KEEP COOL! Ideally mealworms should be stored at 45 degrees, so store them somewhere cool.